Shu, Z., Liu, S., Zhou, L., Li, R., Qian, L., Wang, Y., Wang, J., and Huang, X. (2017). "Physical and mechanical properties of modified poplar veneers," BioRes. 12(1), 2004-2014. To improve the performance and expand applications of poplar plantation wood, modified poplar veneers based on 1-butyl-3-methylchloride ([Bmim]Cl) were studied. Two groups of poplar veneers were impregnated in ionic liquid [Bmim]Cl (group C) and pure water (group B), separately. Techniques such as hot pressing-coagulation and bath-annealing were applied to these two groups to prepare modified samples. The physical and mechanical properties of each group were tested and characterized, using untreated group (A) as the control. 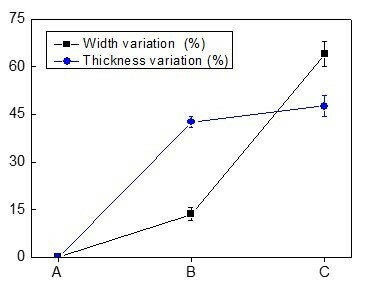 The ductility and thickness variation rate of samples in group C were higher than those in group B. The width variation rate of samples in group C was 64% greater than those in group A and 50.4% greater than those in group B. Scanning electron microscopic (SEM) results also showed the plasticity and the improvement in the transverse connection of samples in group C; these results were more obvious than that for samples in group B. The tensile strength and elastic modulus of samples in group C were higher than those of group B. Compared with the control group, the crystallinity index (CrI) of samples in groups B and C was increased and that of group C was the maximum, but the crystal form remained unchanged. Wood is a viscoelastic material primarily composed of cellulose, hemicellulose, and lignin. Given the appropriate water and heat, the glass transition temperature of lignin and hemicellulose will be lowered to some extent, and the elastic modulus will be rapidly decreased to soften the wood and make it easy to mold (Li et al. 2004; Zhao and Zhao 2007). Water has been applied as a plasticizer to study the fluidity of wood at a given temperature. The research group of Yamashita used a capillary rheological experiment to study the fluidity of wood. The results showed that the moisture content had a great influence on the fluidity and the extrusion quality, and the fluidity was improved with an increase in moisture content (Yamashita et al. 2006). They also manufactured cups by extrusion molding to study the fluidity of Cryptomeria japonica and cedar veneers. The results showed that moisture content and fiber orientation had important effects on the quality of finished products (Yamashita et al. 2007, 2008, 2009). Wood itself is not thermoplastic. Under hydrothermal conditions, only hemicellulose and lignin are thermoplastic during wood molding. Highly crystalline cellulose constrains the quality of molded products (Li et al. 2006). Therefore, there is an increasing demand for a new suitable pretreatment method for improving the plasticity of wood to develop new light and green wood packaging products in a more efficient manner. An ionic liquid (IL) is a low-temperature molten salt that has a melting point lower than 100 °C. The IL is entirely composed of ions and is a kind of liquid-state salt at or near room temperature. It has good solubility for a large number of inorganic and organic materials and has the double functions of solvent and catalyst. Various combinations of cations and anions can regulate the solubility in inorganic substances, water, organic compounds, and polymers, which has given them the name “designer solvents.” ILs can also be recycled after simple treatment (Kosan et al. 2008; Abdulkhani et al. 2013). Some scholars have investigated cellulose solubility (Swatloski et al. 2002; Zhao et al. 2009; Liebner et al. 2010), separation of the three main components of wood (Wang et al. 2011; Yang et al. 2013; Abushammala et al. 2015), and subsequent saccharification after IL pretreatment (Lee et al. 2009; Fu et al. 2010). Some researchers have also made wood or wood fiber plastic using ILs (Ou et al. 2014a, 2014b, 2015). There has been minimal research on the molding of wood products based on the pretreatment of poplar veneer. There are abundant poplar resources, and poplar is one of the main tree species used for afforestation in China. To improve its plasticity, 1-butyl-3-methylimizolium chloride ([Bmim]Cl) was used to impregnate poplar veneer and the effect of [Bmim]Cl on the physical and mechanical properties of poplar veneer was studied. If poplar wood can be directly used to manufacture light and green wood products through the modification of veneers, the efficiency of wood processing will be greatly improved; also, the shape of wood products will be unrestricted, which will have an important environmental, social, and economic impacts. At the same time, the application of fast-growing wood will be broadened to ensure sustainable forestry development (Liu and Bao 1999; Zhang and Sun 2001). So the goal of this research is to provide a theoretical basis for the application of poplars in the field of wood molding products. The hybrid poplar clones aged from 5 to 6 were randomly collected from the agricultural garden at Anhui Agriculture University. The lumbers were air-dried after being peeled. Selected lumbers, free from flaws such as knots, holes, cracks, fungi, and insect damage, were spirally cut into veneers 1.8 ± 0.1 mm thick. Ionic liquid [Bmim]Cl with a purity of 99.0% was purchased from Lanzhou Institute of Chemical Physics, Chinese Academy of Sciences, and used without further purification. Pure water (PW) was manufactured in the laboratory at Anhui Agricultural University. The prepared veneers were randomly selected and cut into 30 mm × 25 mm samples and divided into three groups. Five replicates were used for each group. Each sample was dried to a constant weight at 60 °C in the air drying oven. Group A was kept untreated as the control group. The other two groups were impregnated with PW (group B) and IL (group C). The quantity of solution was sufficient to ensure the immersion of the specimen, but group B required to add water because of evaporation. The impregnation temperature was 80 °C, and immersion time should ensure uniform soaking. The impregnated samples were hot-pressed under a pressure of 10 MPa for 30 min at 160 °C. The hot-pressing created more dissolved lignin and cellulose (Fort et al. 2007). 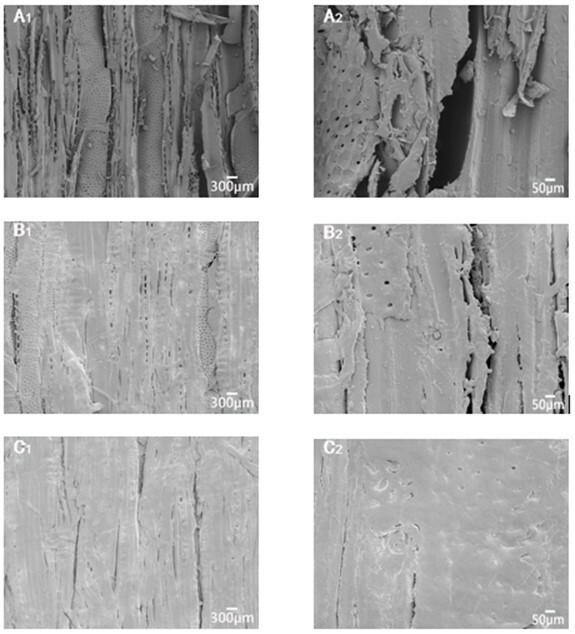 The veneer exhibited plastic deformation without fracture through the control of the processing parameters (Ou et al. 2014a). Partially dissolved veneers were placed into PW at room temperature. In the coagulation bath, water was changed many times to exchange IL within the veneers. While IL was replaced, the components of veneers were recombined. After coagulation, the veneers were annealed by hot-pressing under a pressure of 6 MPa for 30 min at 160 °C. This step not only made the venners molded, but also made the samples dried and the deformation fixed. Scanning electron microscopy was used to visualize the microstructure and evaluate the surface morphology of the modified wood. The samples were dried and subsequently sputter-coated with gold using a ion sputter coater for 30 s with a current of 10 mA prior to observation. Then, the surface topography of the samples was observed with a SEM using an accelerating voltage of 5 kV. The modified samples were cut into longitudinal and transverse samples with dimensions of 30 mm × 3 mm. Three samples each group were selected randomly. The mechanical properties were determined by the standard test method of ASTM D638 (2003), using the electronic universal material testing machine at 25 °C and 50% relative humidity. The crosshead rate was 10 mm/min. where I002 is the intensity of the (002) diffraction angle (near 2θ = 22°), Iam is for non crystalline diffraction background scattering intensity (near 2θ = 18°), and CrI is the relative crystallinity index (Oh et al. 2005). Through macroscopic morphology, it was found that samples from both groups B and C had evident changes, as shown in Fig. 1 and Fig. A. Group B was the PW group without a chemical reagent, C was the IL group, and in the impregnation process, both water and IL can make the veneer swell. After hot-pressing, ductility was revealed in the width of both groups. The obvious changes indicated that water and IL can improve the plasticity of wood. Figure 1 also shows that the width variation of samples in group C was 64% higher than that of group A, 50.4% higher than that of group B. In the thickness direction, samples in groups B and C were compressed without damage under the same treatment process; however, samples in group C were able to be compressed more than those in group B. The results showed that [Bmim]Cl led to a better plasticity than water, which will lay the foundation for the hot-press molding of wood (Yamashita et al. 2006; Ou et al. 2014a; Šprdlík et al. 2016). Compared with the untreated group, both PW and IL treatment could improve the plasticity of the veneers from the microscopic morphology (Fig. 2). During the impregnation and hot pressing, ionic liquid [Bmim]Cl may partially dissolve wood cell walls, namely cellulose, lignin, and hemicellulose (Sun et al. 2009). And a small amount of dissolved components will be lost in the IL, while most will be kept in the veneers. Due to the combination of pressure and temperature during hot pressing, dissolved components in the venner made the deformation easier, which greatly improved the ductility of the veneer. In the coagulation bath, IL dissolved in the water, while most of the wood components did not dissolve. When the IL was transferred into the water, the dissolved cellulose recombined to regenerate because of hydrogen bonding (Kilpeläinen et al. 2007). The regeneration structure was fixed in the final molding process. However, the plasticity generated by water was limited, and the three main components in the wood could not be dissolved by water. In Fig. 2, more pores were observed in B1 and B2 than in C1 and C2. Through microscopic morphology, the flowability of samples in group C was found to be better than those of group B. Because of the anisotropic structure of wood, the bonding strength of the transverse interface was much weaker than the longitudinal interface. When the force was applied in each direction, the maximum stress of the wood varied. The tensile strength of the longitudinal sections was much larger than that of the transverse sections. The mechanical properties of wood also exhibited anisotropic characteristics (Dudziak et al. 2016 ). Stretching along the longitudinal interface, the force direction was along the fiber orientation. Stretching along the transverse interface, the force direction was perpendicular to the fiber direction. The longitudinal and transverse tensile strength and modulus of elasticity were listed in Table 2. An obvious change in the mechanical properties of the different groups can be seen in Table 2. Especially for the tensile strength, the longitudinal and transverse performance gap between groups B and C was narrow. According to the data in Table 2, the ratio between the longitudinal and transverse tensile strength in group C was 38.99, which was obviously less than the one of 58.50 in group B. Meanwhile, it was found that the transverse specimens of the untreated group were not able to be collected completely, which indicated the transverse tensile strength was very low. Table 2 indicated that the longitudinal and transverse performance of samples in groups B and C was improved, and that the performance of samples in group C was better than that of samples in group B. The IL was able to not only soften and swell the veneers, but also dissolve a small amount of their components, while water can only soften and swell the veneers. During hot-pressing, the IL had almost no vapor pressure and dissolved more components of the veneers. On the other hand, water evaporated at a high temperature and pressure, and pyrolysis of the components easily occurred. Regarding the IL group, the impact of the coagulation bath on the veneers was very important. The dissolved parts of the wood components formed new connections in the radial and tangential sections through the transverse transportation system. After regeneration, the new structure was fixed and a transverse weak network was formed, which can strengthen the weak interface and improve the transverse mechanical strength (Kilpeläinen et al. 2007). However, the results from the water group showed that water can only swell the veneers to a certain degree. The deformation was easy to recover when the external force was removed, and to fix the deformation, all samples were annealed at the last step. Softening and dissolution made the samples less rigid before annealing. After the annealing treatment, the rigidity was recovered. As demonstrated in Table 2, the modulus of elasticity (MOE) of samples in group C was the highest and the MOE of samples in group B was slightly less than that of samples in group A. The difference in MOE may be explained by the components lost from samples in group A because of the high temperature and pressure during the hot-pressing and annealing process. From Fig. 3(a), the 002 planes of group A, B, and C were located at 21.97°, 21.85°, and 21.73°, respectively, and their 001 planes were located at 15.82°, 15.11°, and 15.23°, respectively. Each treated group exhibited the same cellulose crystal form (cellulose I) as the control, which suggested that [Bmim]Cl may not destroy the cellulose crystal matrix in our research (Wei et al. 2012). CrI was used to represent the proportion of the crystalline region in the polymer. According to Fig. 3(b), the CrI values calculated using Eq. 1 were 67%, 72.5%, and 73.4%, respectively, which indicated that the CrI of the treated groups increased compared with the control, and that samples in group C had the highest degree of crystallinity. The water treatment group had soluble components that dispersed in the water when immersed at 80 °C. After being hot-pressed at 160 °C, hemicellulose was easy to use in pyrolysis. All of these factors contributed to an increase in the proportion of cellulose crystalline region. Therefore, the CrI of samples in group B was higher than that of samples in group A. For the IL treatment group, veneers were fully swelled and only a few components were dissolved when dipped in 80 °C. When hot-pressed in 160 °C, more lignin and carbohydrates were dissolved. At the same time, the thermal mobility of the cellulose chains increased under the high temperature, which facilitated the rearrangement of amorphous cellulose. In the coagulation bath, the dissolved parts regenerated. The higher CrI may be primarily attributed to the loss of dissolved hemicellulose during the coagulation bath, but this is not the case for the veneer treated with [Bmim]Cl (Kilpeläinen et al. 2007). Modified poplar veneers were successfully prepared using four steps: impregnation, hot pressing, coagulation bath, and annealing. The environmentally friendly solvent [Bmim]Cl partially dissolved the three main components of wood and laid groundwork for future research on molding wood products. The width variation rate of samples in group C was 64% more than samples in group A, and 50.4% more than samples in group B, which showed a certain ductility in the width of samples in group The thickness variation rate of samples in group C was higher than that of samples in group B, suggesting that the ionic liquid [Bmim]Cl led to better plasticity than did pure water during the process. Considering the results from SEM, both PW and IL improved the plasticity of wood. However, PW cannot dissolve wood components, so the pores still remained after annealing. Each group had the same crystal form, but the CrI of the treatment groups increased. During the impregnation and hot pressing, the partially dissolved components were regenerated in the coagulation bath. Therefore, the CrI of samples in group C was the largest, reaching 73.4%. The authors are grateful for the support of the Educational Commission of Anhui Province, China, Grant No. KJ2016A231, and the Discipline Backbone Cultivation Project of Anhui Agricultural University, Grant No. 2014XKPY-57. ASTM D638 (2003). “Standard test method for tensile properties of plastics,” ASTM International, West Conshohocken, Pennsylvania, USA. Li, Y. B., and Lin, Z. Y. (2006). “Non-tradition application of wood: Thermoplastic wood, wood-plastic and wood-ceramic,” New Chemical Materials 34(2), 54-56, 70. Li, D. G., Li, J., and Liu, Y. X. (2004). “Effects of heat treatment on permanent fixation bending deformation in wood of Fraxinus mandshurica,” Journal of Nanjing Forestry University (Natural Sciences) 28(3), 23-26. Liu, S. Q., and Bao, F. C. (1999). “Current situation and development trends of research on wood properties, processing & utilization of poplar plantation in China,” China Wood Industry 13(3), 14-16. Segal, L., Greely J. J., Martin A. E. J., Conrad C. M. (1959). “An empirical method for estimating the degree of crystallinity of native cellulose using the X-Ray diffractometer,” Textile Research Journal 29(10), 786-794. Yamashita, O., Yokochi, H., Imanishi, H., Miki, T., and Kanayama, K. (2006). “Flow phenomenon of bulk wood,” The Japan Society of Mechanical Engineers 72(724), 2074-2078. Yamashita, O., Yokochi, H., Miki, T., and Kanayama, K. (2007). “Producing cups from wood by extrusion using flow phenomenon of bulk wood,” The Japan Society of Mechanical Engineers 73(729), 583-588. Yamashita, O., Yokochi, H., Miki, T., and Kanayama, K. (2008). “Forming of rotary-cut Japanese cedar veneer by taking advantage of its fluidity,” Journal of the Japan Society for Technology of Plasticity 49(572), 881-885. Zhang, Z. T., and Sun, L. Z. (2001). “Development and utilization of poplar resources in China,” Forestry Construction 8 (5), 21-24. Zhao, P., and Zhao, G. J. (2007). “Progress in research on the deformation and fixation of bended wood and wood-based composites,” China Forest Products Industry 34(3), 8-10, 21. Article submitted: August 29, 2016; Peer review completed: October 15, 2016; Revised version received and accepted: January 2, 2017; Published: January 31, 2017. From the macroscopic photos, the differences of color and ductility were obvious. Regarding group B without adding any chemical reagent, it was obvious that water can swell the wood and play a role in plasticity. Especially after hot-pressing, there was an obvious change in the width direction of veneer. Group C exhibited a deepened color and its change was more obvious in the width direction.